This is the first book I have read by Kate James and is the second book in the K-9 trilogy (I am going to read the first book soon!). I really enjoyed this tail (hehe). I am a huge dog lover and also love what the K-9 unit dogs do to help serve the public. They are very brave! Throw in a redhead vet and a tall dark handsome police officer and we have a fun romance with a little mob crime included. 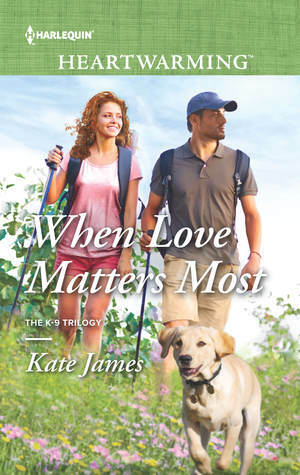 Kate writes this story with a lot of love and passion for animals. It flows very well and keeps you wanting to see what will happen next. I love how well researched this book was to give us a real understanding of a K-9 dog and how they work with their handlers. How could one not fall in love with Rick? He has a heart of gold and a head on his shoulders at such a young age for a guy. The romance that Rick and Madison develop is a sweet one with the struggles of both of their careers, family and beliefs. I loved this story and can't wait to read the rest of the series to learn more about the other characters. I give this a book a 4.5 out of 5 stars.